Chefs, on the whole, tend to drink more than college students on their 21st birthdays and pirates combined. Anthony Bourdain, who has spent a minute or two around chefs, tells us why. In a new interview on Marc Maron's WTF podcast promoting his upcoming cookbook Appetites: A Cookbook, Maron was complaining about how chicken salad sandwiches rarely have dark meat in them. And that led to Bourdain thinking about the poor choices people make at restaurants (like asking for tasteless white meat instead of the good stuff), and the unintended effect that has on chefs. "Chefs tend towards drinking so much and having long periods of self-loathing and depression because experience teaches them again and again that people don't want the good stuff," he said. "They insist on the bad stuff. It's broken a lot of chefs." 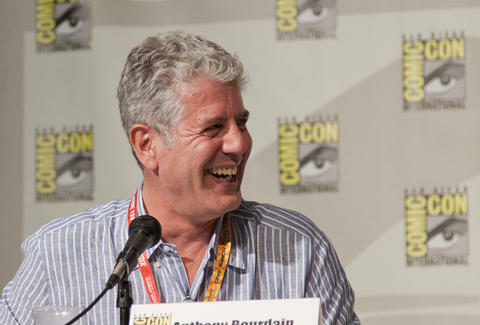 Bourdain gave an example of how chefs can get disheartened. "[Let's say] you're a chef cooking at a popular restaurant, and you put a bunch of beautiful specials on the menu," he said. "When [customers] come in the kitchen and compliment you, they say, 'Oh, the filet mignon was wonderful!' -- which [is a dish] you could train an intelligent monkey to do. And it's one we hate." He ended that part of the interview on a hopeful note, saying that with "the hipster invasion, there's hope for all of us." After all, they like the good stuff. Lee Breslouer is a senior writer for Thrillist, and enjoys chicken salad. Follow him to the chef's special @leebreslouer.